I came across this image some time ago and it does look in 13th century style to me, but I can't find any source for it anywhere. 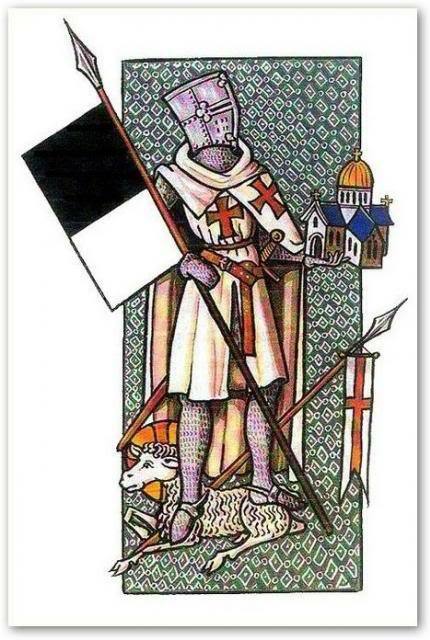 Does any of you know where this picture comes from and if it is really a 13th century image or done later in 13th century style? Seems like a modern drawing. Look like Maciejowski Bible but might be modern art. The background of the picture (the lozenges and dots) stands out to me mainly. A medieval artist, I think, would have tried to make them far more uniform than they appear here. This reminds me of the work of Dan Escott. Almost %100 sure that this is modern. Pretty cool though. The largest image online seems to be at the following site. You could always e-mail them and inquire what the source might be. The medieval practice of showing someone holding a small church or other building usually indicates they had it built. I think it's a pretty good modern pastiche of medieval art, but the artist tries a little too hard -- the shadows on the knight and his cape are too detailed and realistic.